I am so excited to post our new activities tonight. This unit was quite a challenge to put together. Now that it's finished, I'm amazed at all the content we're covering, the way we've been able to make it little kid friendly, and how much fun it will be for the kiddos. Bulldozer's been melting down a little bit more than usual before learning time. I asked him what was wrong and why he was so sad. He explained that learning time has been "too hard" lately. I kept that in mind as I filled our shelves, making sure there was at least one "easy" activity for him in each subject area. Before I share our activities for the week, I want to take the chance to thank you, my readers. This month, I've embarked on a new journey. I'm no longer blogging for fun, but blogging for income. Our family has come across some difficult times at the start of the new year. Monetizing my blog is a way I can contribute financially, while staying at home with my kiddos. If it's not too much to ask, I'd love it if you could share my blog with everyone and anyone you know. I'm working hard to gain a larger blog audience, more followers, and "likes" on facebook. By the end of the month I would love to increase my blog followers to 50, and increase my facebook likes to 500. The goals are big, but I know I can achieve them with your help. Please stop by often. Instead of posting one post per week, I will be increasing my output to three posts a week. There's so much I want to share with you all. As a special thank you for your love and support, I've vowed to keep all of my printables free. I'm hoping to even have a page with links to all my free printables available on the blog in March. Now moving on. Here's what we're doing this week! Bulldozer has been asking to use our dot markers, especially since he's seen Sunshine using them with her activities. Since I know he goes overboard, sensory wise, when using the markers, I tried to design an activity that would require him to reign in a little bit, but still have fun at the same time. The kiddos will use the dot markers to mark the correctly spelled word that matches the one above the picture on the left. 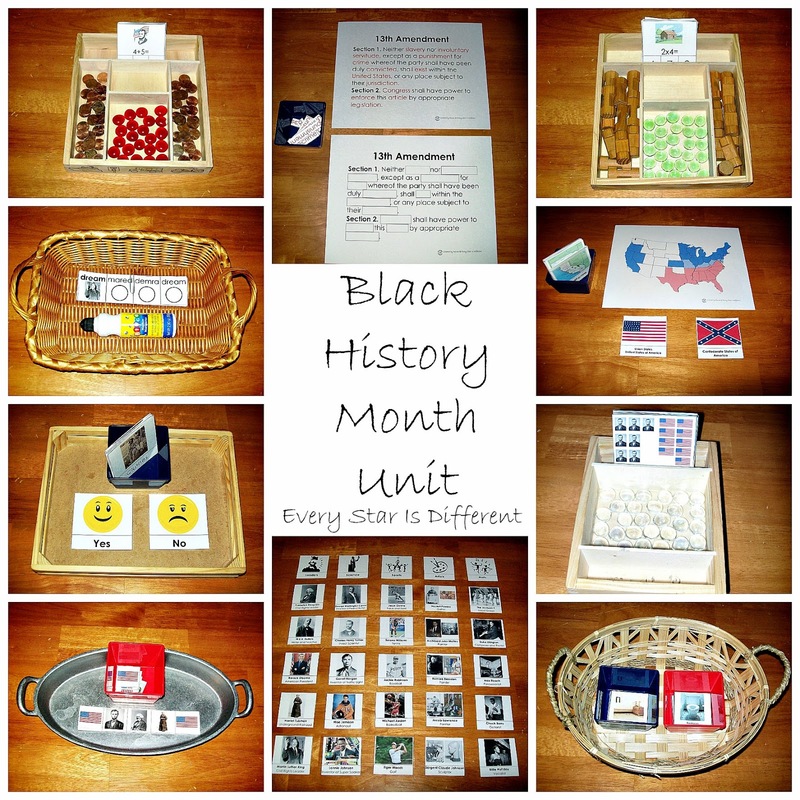 Source: I created the printable for this activity as part of my Black History Month Language Printable Pack. For your free copy, click on the link at the bottom of this post. This week, the kiddos will be introduced to the 13th Amendment of the Constitution. Since it's a very overwhelming document for little kiddos like mine, I decided to make this activity as simple as possible. Over the course of the week, we'll practice pronouncing the big words (in red) and talk about their meanings. Using the control, the kiddos will then place the missing red words in the blank spaces. When they're finished we'll read it together. The salt tray is back on the shelves again this week. Bulldozer has really missed it. His writing is starting to show it too. I'm hoping the daily practice will continue to help him. Source: The printable card set used for this activity can be found at Homeschool Creations. Dinomite and Bulldozer really love these cards, so I wanted to continue with them for as long as they enjoy the activity. You'll notice pictures of Abraham Lincoln, Fredrick Douglass, the American Flag, and the Confederate Battle Flag. All are very important parts of our unit study this week. I really find it hard to study this history, without studying the Civil War and Abraham Lincoln at the same time. Source: I created the printable for this activity as part of my Black History Month Math Printable Pack. For your free copy, click on the link at the bottom of this post. It's been a long time since we've reviewed patterns. The kiddos will finish the patterns using the pieces provided. The kiddos will practice their addition skills, answering the questions on the cards. They'll use pennies as manipulatives, as Abraham Lincoln is on our penny. Last week I was a little nervous about introducing multiplication. Boy was I in for a surprise. Dinomite did some multiplication during his morning work and did fabulous with it, however he didn't touch the multiplication activity on the shelves. Princess did! Not only did she choose the activity, but she understood it and did it accurately. She blows my mind sometimes. This week we're using Lincoln Logs as counters in honor of Abraham Lincoln. It's very difficult to talk about Black History and not talk about slavery. Still, I wanted to keep the topic as simple as possible. I designed this activity to help the kiddos understand what it would be like if they were slaves. There are many different accounts about the lives of slaves, so I went with the most basic concepts I found. These cards in no way explain the idea of slavery in detail, but can lead to discussions you may choose to pursue in your classroom. The kiddos will separate the cards into two categories: Things they would have if they were a slave (those things provided by their masters), and things they wouldn't have or would have no choice about if they were a slave. Source: I created the printable for this activity as part of my Black History Month Geography & Culture Printable Pack. For your free copy, click on the link at the bottom of this post. I'm using this activity to explain what happened after the Civil War, and then what happened during the Civil Rights Movement. There are two ways to do this activity. Either kiddos can play a memory game, finding matches and placing the two cards, one on top of the other, or they can just match up the cards, without the game aspect of things, placing one on top of the other when they're done. The cards show pictures of "Separate But Equal" aspects of life before the Civil Rights Movement. We will go over the cards together, discussing each picture and what they mean before playing. The most important part about this activity, is making sure the kiddos lay the matches one on top of the other symbolizing the sharing of the objects/places in an equal way. Who's Who in Black History? There are so many amazing people we could study this week in honor of Black History Month. In this activity the kiddos will divide the people cards up by category, learning about some pretty spectacular people from the past and present. Not all fabulous people are included. Perhaps we'll expand next year. I love this activity on our shelves because it incorporates geography and history all in one. The kiddos will sort the cards, placing them under their proper flag. They will use the map provided as a control. Each day of the week, we'll highlight one of the scientists mentioned on our Who's Who in Black History activity. We'll be reading some books about them, discussing what they did and reviewing some other science subjects in the process, like Astronomy. It is also my hope that we can take a field trip at the end of the week, but that will be weather dependent. Each day of the week, we'll highlight one of the artists mentioned on our Who's Who in Black History activity. We'll study some of their works and learn more about them, applying our knowledge to some prompts in our daily journal. We'll continue to practice the piano and sing every day. We will also highlight one of the musicians mentioned on our Who's Who in Black History activity, each day of the week, watching videos of them performing if available, and learning one of their songs. We continue with our Family Fitness Program. The kiddos will practice spreading peanut butter on a slice of bread. Bulldozer will use Sunbutter for allergy purposes. This activity is always a favorite. The kiddos will build with the Lincoln Logs. The kiddos will practice their sweeping. A square will be provided on the floor. The kiddos will practice putting together the puzzle. My apologies for this activity not being completely set up. The kiddos will be provided with a basin full of soapy water, a dirty plate from their last meal and this scrub brush. They will practice scrubbing the plate until it's clean. The kiddos will have a basin filled with water, a hand held magnet, and 20 items. They will put the items in the water and then fish around with the magnet to see what they can pull out. My apologies for no picture. For those interested in the printables, click on the links below. I hope you enjoy the printables as much as we do. If you notice any errors in any of the cards, please let me know! Thank you! Thank you so much Deb! Your support means the world to me. Love these!! We are going to try and fit some of them in this week :). Have you considered adding a link to your facebook page on the sidebar of your blog? I had to go to Facebook and search for you to find it. You may get followers faster with a link. Just thoughts :). What wonderful activities!! Thank you for sharing at Sharing Saturday! !